What is Your NAB Strategy – Part 2 | Createasphere: the leading builder of professional communities for content creation technology and media companies. My time at NAB was well spent. Was Yours? As I noted in my blog post What is Your NAB Strategy – Part 1, I determined that on average each exhibitor had 28 minutes with a potential customer in the booth. NAB announced its show figures with a 4% increase on registration totaling 98,015 and final attendance number of 93,850. That is a lot of peeps, a lot of hand shaking, a lot of conversations and a lot of demos. Let’s now focus on a lot of closed sales. With that being said, I have already started to get my on slot of “open house” type events, phone calls from the telemarketing team that has my badge info as it was swiped when in the booth (for my precious 28 minutes) and every industry publications is reporting on the same things – their post event technology wrap up. Just in my inbox counting the events, calls and editorial pieces it makes a total of twelve BUT they all look, feel and read the same. Nothing seems to be cutting out of the NAB pack. Regardless if you and your company are going to partake in one of these many post NAB events or not, let’s discuss cutting out of the pack to get your clients attention and then most importantly close the sale. Yes, I did include host. If you want to be of service and value to your client or potential client, think about their time off the job. Either attending your event, taking your telemarketing call or reading your article. Take good care of them. Only present the most valuable information, include education (not just about you and your products), and give them clear information to walk away with. This has value and defines you as a good host. So cut the marketing fluff out and help them do their job better. This is what I outline in Stage 4 (take action) of the report noted above. I know the later seems silly to mention, but so critical. I am constantly amazed with many of our consulting clients that the close if forgotten more often than not. Why? I guess it goes back to our core fear of rejection. Well, suit up and ask for it! Also know that if you have followed all the stages in building your customer community, then you have build a solid foundation and the ask will be a natural progression. Asking for what your client might need, might be a bit more complex. Why? Well in many cases they actually don’t know what they really need to solve their issues or problem. But if you know them, item #1 – and you know “what keeps them up at night” then you can become their resource and solution master and close your sale. 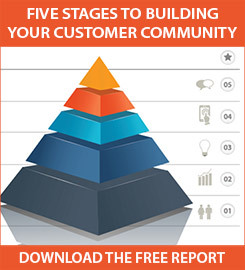 But more importantly build your customer community and strengthened it for the future and your future sales. Createasphere is the leading builder of professional communities for content creation technology and media companies. We work with organizations at strategic points in their growth to build new audiences, while engaging current fans. The company was founded in 2001, by Kristin Petrovich Kennedy, who continues to serve as its founder and president. Kristin, and her team, have created numerous conferences, trade shows, coalitions and professional groups, for the purpose of bringing creative professionals together, as well as connecting them with the services, products and knowledge they need to thrive in their chosen field.